The mini kaoss pad 2 provides an MP3 player that can play back audio data from a microSD card. You can save your favorite songs on a card, and apply real time effects to the song as it plays. Store sound effects or other audio material that you want to use during your DJ session, or save your favorite song data and then enjoy applying various effects to it. Unlike previous KAOSS PAD models, the self-contained mini KAOSS PAD 2 allows you to perform without requiring any additional equipment as input sources. 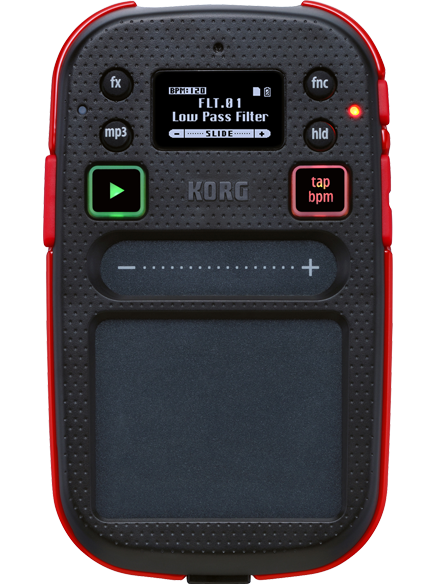 Both the WAV format as well as the MP3 format is supported; you can use mini KAOSS PAD 2 for professional performances that require high audio quality. * SDXC cards cannot be used. Check out the supported microSD/microSDHC cards here. The playback speed of the internal MP3 player can be varied using the VALUE slider. 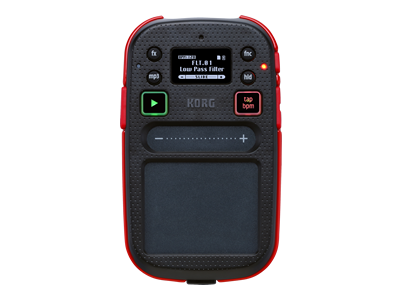 The mini KAOSS PAD 2 also allows you to set a cue point specifying where in the song playback will start. In addition, the VALUE slider can be used as a fader to adjust the volume balance between the external audio input and the MP3 player, allowing the mini KAOSS PAD 2 to be used as a serious DJ player or a simple mixer. Add the mini kaoss pad 2 as the third player in a DJ set, enjoy exciting DJ play by combining two mini kaoss pad 2s, or load your mini KAOSS PAD 2 with sound effects or voice samples and use it as a sample player!